After meeting with the High School Band students to discuss an alternative trip this summer, they requested, and we have decided to visit to Nashville, TN June 4-5th! We are really excited about this trip, as we have been able to meet all of their requests. While in Nashville we will be staying at the Gaylord Opryland Hotel (atrium view rooms!). We will experience Nashville’s rich music culture with performances at the Grand Ole’ Opry and BB King’s Blues Club. We will also experience a back-stage tour of the Grand Ole’ Opry, plus visit The Parthenon, Studio B, Hatch Show Print, The Country Music Hall of Fame and spend some time on Broadway. They'll also learn to line dance at the Wildhorse Saloon. If we have time we'll also let those interested hit the Opry Mills Mall. The Arcola Band Boosters will be funding the majority of this trip, with an out-of-pocket expense to the students of only $125 each. Students were handed an informational packet last Friday (April 5th). If you haven't seen it yet, you may download it below. It includes a rough itinerary, along with a parent permission, student agreement & registration form. THE DEADLINE TO REGISTER IS THURSDAY, APRIL 18TH. If payment arrangements are desired, please just give Kris a call at 390-2271, we're happy to assist. It's important that we get a headcount by this date, in order to reserve the correct number of hotel rooms, and purchase concert tickets. Late registration may not be accepted. At this time we are not in need of chaperons. However if you are interested in joining us on this trip, please contact us for rates. This trip is not contingent on number of participants, however we hope many students decide to attend this fun & education getaway. Pick up for the Fannie May fundraiser will be Monday, April 15th between 4-6 pm in the band room. This fundraiser originally was suppose to be delivered to homes, that is no longer the case. It will need to be picked up in the band room on Monday the 15th. If this creates an issue for you please contact Kris Bott @ 390-2271. Thank you! SEE ANY ARCOLA BAND STUDENT! Arcola band students (grades 5-12) will be holding a Fannie May Fundraiser March 5-15th. Items in the catalog include Fannie May's famous cream eggs, as well as chocolate Easter bunnies, and an assortment of other chocolety goodness. All items will arrive in time for Easter! 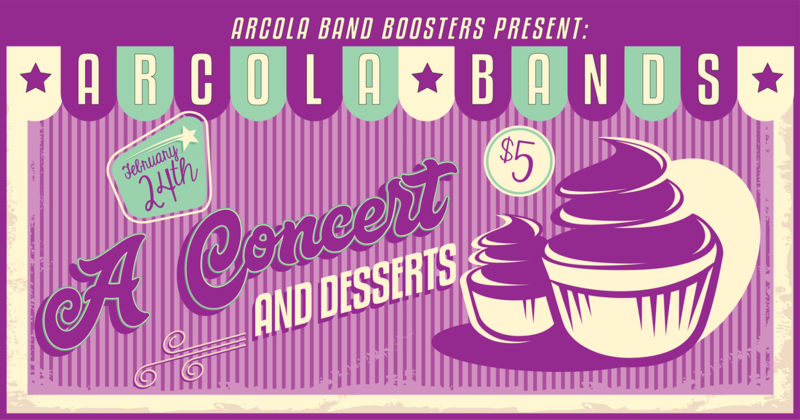 We are very excited to bring back the annual "Tunes & Treats" the Arcola Bands' Dessert Concert. 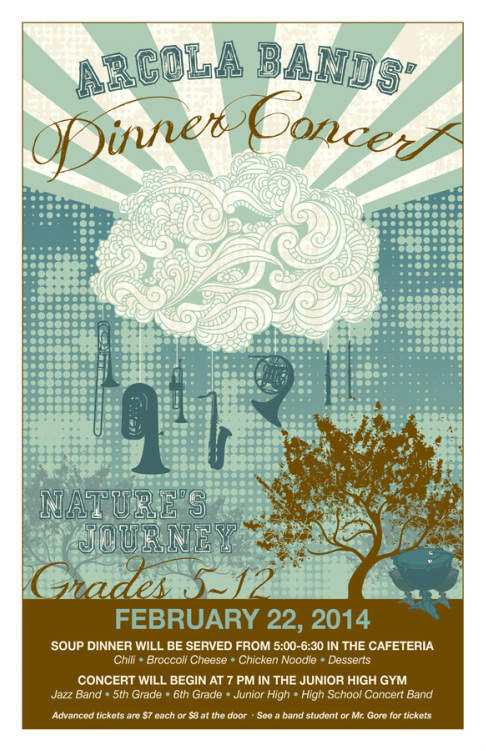 The concert will feature grades 5-12 and will be held on SATURDAY, FEBRUARY 23RD AT 7 PM in the Junior High Gym. Doors for the concert will open at 6:30 pm, and admission is just $5. Tables will be on first come first serve basis, overflow bleacher seating will be available. DESSERT DONATIONS: All students in grades 5-11 are asked to donate a dessert to be served during the concert. Desserts may be sent to school with your student on Friday the 22nd or delivered to the junior high gym on Saturday the 23rd between 3-5pm. We are not allowed to serve desserts that require refrigeration. Popular desserts are: pies, cakes & cupcakes. Some desserts may be set back for a bake sale at the end of the concert. Any non-disposable containers may be picked up after the concert. GYM SET UP: We need volunteers to help set up tables and chairs, along with help decorate the gym. We will also need volunteers to help dish out desserts. You may sign up to volunteer by CLICKING HERE or calling one of the following boosters members: Sean or Kris Bott (217-390-2271), Nancy Byard (217-273-1366) or Kristi Myers (217-246-8046). Congratulations to ILMEA ALL-DISTRICT MUSICIANS! Following a competitive audition process, fourteen Arcola junior high and high school students have been selected to take part in the Illinois Music Educators Association (ILMEA) District 5 Festivals for jazz, choir, and orchestra. Selected for Junior Choir were: Fatima Cabrera, Andy Castro and Aaron Gaona; Junior Band: Eadie Budd (flute), Izzy Hensley (flute), Jake Myers (tuba), Rey Oyervides (clarinet) and Aden York (flute). Selected for Senior Choir were: Taylor Brown and Kenyon Byard; Senior Treble Choir: Aileen Acosta and Olivia Key; Senior Jazz Band: Myles Bott (tenor saxophone); and Senior Orchestra: Braedyn Edwards (percussion). Based on their audition scores, later this fall the students (grades 10-12) will learn if they have qualified to perform at the ILMEA All-State Conference held in Peoria in January 2019. Congratulations to our students for all of your hard work and for achieving this great honor! (l-r) Braedyn Edwards, Olivia Key, Kenyon Byard, Taylor Brown and Myles Bott. Not pictures is Aileen Acosta. ( l-r) Isabelle Hensley, Eadie Budd and Fatima Cabrera; (back) Andy Castro, Aden York, Reynol Oyervides, Jake Myers and Aaron Gaona. It's that time again! Who's ready for the 2018-2019 marching season?! This year's marching band show is "West Side Story". Music packets were sent home at the end of the school year. I expect all students to look over the music this summer as well as memorize the pregame show music, the National Anthem and the Arcola school song. We will not have Rookie Camp this year for freshman, but on Monday, July 30th, everyone must report for marching band camp. Band camp will run the entire week and it will end on August 3rd. The entire marching band is required at those practices between 8 am and 2 pm. We will have evening rehearsals on Tuesdays and Thursdays that week from 6-8 pm as well. Please remind your band student to come to band camp with penny of water to stay hydrated, to bring hats and of course, sunscreen. We will be spending time inside during the day and we will be taking breaks to come inside and enjoy the air conditioning. It is extremely important that all band students come to every rehearsal. Our corp is only as strong as each and every indiducal member is. Everyone needs to be on the same page, in order to feel confident and we need to begin together, in order to march boldly into the new marching season. PLEASE JOIN US for A Concert And Desserts on, Saturday, February 24th at 7 pm, in the Junior High Gym. This concert will feature bands in grades 5-12th. ADMISSION to the concert will be just $5 at door, and doors will open at 6:30. Tables are on first come first serve basis, overflow bleacher seating will be available. This is one of the band’s largest fundraisers of the year. Funds from this event help purchase new instruments and other needs of each band. DESSERTS: All students in grades 5-11 are asked to donate a dessert to be served during the concert. You may send your dessert to school with your student on Friday the 23rd or deliver it to the junior high gym on Saturday the 24th between 3-5pm. We are not allowed to serve desserts that require refrigeration. Popular desserts are: pies, cakes & cupcakes. Some desserts may be set back for a bake sale or silent auction. GYM SET UP: Please consider volunteering a little of your time to help us get the gym ready for the students' concert. To sign up, you do so by clicking on this link: SIGN UP or email, text or call Sean & Kris Bott (217-390-2271 / bott.kris@gmail.com). The Arcola Music Department is pleased to announced that ten Arcola junior high and high school students have been selected and invited to participate in the Illinois Music Educators Association (ILMEA) District 5 Festival. Competitive auditions for the district festival took place on October 9th at Effingham Jr. & Sr. High Schools. The festival will be held held Saturday, November 18th on the campus of Eastern Illinois University. Band, choir and orchestra members will attend an all day rehearsal, with multiple concerts held in the evening. Admission to each concert is $5 and is open to the public. Selected for Junior Choir were: (l-r) Fatima Cabrera, Avery Pullen and Sadie Tomasello; Senior Choir: Rosa Carmona (sophmore); Selected for Junior Band: Eadie Budd (flute), Rilee Hendrix (flute) and Rey Oyervides (clarinet); Senior Band: Myles Bott (sophomore/tenor saxophone) & Sarah Haynes (junior/flute); Senior Orchestra: Hannah Warfel (senior/violin). The junior high choir director is Mrs. Ronda Reinhart, and junior high band, high school choir and high school band is under the direction of Mr. Eric Mueller. Based on their audition scores, later this fall the students (grades 10-12) will learn if they have qualified to perform at the ILMEA All-State Conference held in Peoria in January 2018. This will be a very special event where our high school marching band, along with several other area high school bands will be performing with the "Nation's Premier College Marching Band" The Marching Illini during half time show at the Illini game at 11 am on September 2nd against Ball State University. We are extremely excited about this event. It's sure to be an experience our students will never forget! Detailed information regarding Band Day can be found at: http://marchingillini.com/illinois-band-day/ . Along with maps & traffic routes for game day. The schedule is tentative, and our departure time has not been set, but it will be very early. If you have any questions, please contact Mr. Mueller. Who's ready for the 2017-2018 marching season? We are very excited, it's going to be a great year! Rookie camp starts next week, and we wanted to post a couple reminders and the camp schedule. Camp is mandatory for all members. Students are allowed to stay on or leave campus during their lunch break, please bring lunch accordingly. Tennis shoes are required, no open toe shoes during camp please. Bring plenty of water to stay hydrated. We'll be spending time inside classrooms and outside on the field. Hats & sunscreen are a must! Students should be reviewing their marching band music they received at the end of the school year, and have memorized all pre-game music. (National Anthem & school song) Please show up to camp prepared, with a good attitude, and ready to work together so we can all have a great year! Below is the marching band order form. This order form is due the last day of band camp, August 4th. Please, regardless of funds, make sure this form is given to Mr. Mueller. Pictured front row (l-r) Sarah Haynes, James Lopez, Sam Crane, Braedyn Edwards, Mariana Corona and Alexia Guarjardo. Back row (l-r) Olivia Key, Jacob Butler, Director Mr. Eric Mueller, John Hornung, Myles Roberts, Myles Bott, Maggie Fulton and Jennifer Thompson. The Tri-M® Music Honor Society inductions for the 2016-2017 school year were held in February 2017. Newly inducted members included: Freshman: Myles Bott, Jacob Butler, Mariana Corona, Braedyn Edwards and Alexia Guarjardo. Sophomores: Sarah Haynes, John Hornung, Olivia Key and Myles Roberts. Juniors: James Lopez and Sam Crane. Returning members include: Juniors - Samuel Dickinson and Hannah Warfel, Seniors - Maggie Fulton and Jennifer Thompson. Two students in the music department at Arcola High School have been named Illinois Music Education Association (ILMEA) All-State Musicians. Hannah Warfel (left) earned placement in the All-State Orchestra, while Maggie Fulton (right) earned placement in the All-State Honors Chorus. The students attended a three-day festival January 26th-28th in Peoria, rehearsed under renowned guest conductors and performed in the ILMEA All-State Music Festival on January 28th at the Peoria Civic Center. Students were selected through a rigorous audition in October and participation in the ILMEA District 5 Festival in November at EIU. The ILMEA All-State Festival is a collection of the top 10% musicians from each of the nine ILMEA districts. Congratulations Maggie & Hannah on this great honor! Eight Arcola Jr. and Sr. High School musicians have been invited to perform at the upcoming Illinois Music Education Association (ILMEA) District 5 Festivals at Eastern Illinois University on November 19, 2016. Admission is $5 and open to the public. Selected for Junior Band were: Zachary Butler, Blaze Rich & Johnny Lopez. Selected for Senior Choir were: Maggie Fulton (senior) & Jennifer Thompson (senior). Selected for Senior Band were: Myles Bott (freshman) & Samuel Dickinson (junior). Hannah Warfel (junior) was selected for Senior Orchestra. Congratulations to all of our students for all of your hard work and for receiving this great honor! Marching Band Supply Order Forms were sent home with students today. If your student did not bring one home, you may click the link below to download & print. We need quick turn around on these, and they need to be returned by Thursday, August 17th. Let's see if we can get 100% compliance. If this creates a financial burden for your family or you need to delay payment, please speak to Mr. Mueller. NEW STUDENTS: All items below are required, if you do not already own them. Every new student should turn in an order form. If you're uncertain about the glove size, try on a couple in the uniform closet. We'll order some extras so if yours do not fit - don't worry. RETURNING STUDENTS: Please take time to make sure your shoes from last year fit. Also check to seeif you need new gloves. ALL MEMBERS: We want everyone's polo this year to look similar. If you have an old polo that does not have white on it, you will need to order new. Senior members, if you have the old style polo (with no white), you will also need to order new. However, boosters will purchase this polo for you. It will need to be turned back in at the end of the school year. Any questions see Mr. Mueller. Can you believe that band camp is just ONE WEEK away? We are SO excited! By now each of the students should have received their band camp schedule, marching night practice schedule, performance schedule, and their field show music. If they did not stop by the band room to pick up their music, this was mailed home to them. If you have not received any of the above items, the letter that was mailed how can be downloaded by clicking the link below. If you do not have your field show music, please contact Mr. Mueller ASAP at: emueller@arcolaschools.com. Sneakers - NO open-toed shoes will be allowed on the field! Your lyre, extra reeds,valve oil, etc. Lunch - if you're staying on campus. We are looking very forward to a great marching season! Parents - the band boosters will be providing the students lunch on Friday the 5th. We would love contributions to this meal, and if you're willing to donate, please contact Kris Bott @ 217-390-2271 or bott.kris@gmail.com. Thank you! The Tri-M® Music Honor Society, the honor society for secondary school music students, announces the chartering of a new chapter at Arcola High School in Arcola, IL, under the leadership of Mr. Christopher Gore & Mr. Eric Mueller. The formation of this chapter signifies the school’s recognition of the importance of the arts in the development of a comprehensive educational program. The Tri-M Music Honor Society provides a means of recognizing the efforts and achievements of music students who volunteer their time and share their musical talent with others. Since 1952, almost 5,000 Tri-M chapters have been chartered in the United States and abroad, and current membership exceeds 50,000. Newly inducted members at Arcola High School are: Colin Beres, Dylan Bugos, Eva Corona, Samuel Dickenson, Maggie Fulton, Ashley Oyler, Lauren Shafer, Jennifer Thompson and Hannah Warfel. Seniors receiving their Tri-M graduation chords were: Colin Beres, Dylan Bugos, Eva Corona, Ashley Oyler and Lauren Shaffer. Our Chicago Band Trip is this Saturday, and we are getting pretty excited! Last week we found out that we have FRONT ROW Blue Man Group tickets! Parents, If your student is anything like most, their Chicago trip itinerary & information is in the bottom of a book bag, or on the floor board of their car. You can find that same information in the photo to the left. We will report to the band room at 6:30 am on Saturday, and leave at 7 am. We will arrive at Six Flags Great America at approximately 10:30 am. A couple things to note about Six Flags: 1. One meal is provided, and one meal is on your own. 2. The water park will be open, however, this cost is not included in your trip. Therefore if you'd like to go to the water park, bring $10 and your swim suit. Sunday, we will spend a little bit of time at Gurnee Mills Mall, where lunch is on their own. We will head to our Blue Man Group for our 4 pm show, then eat dinner at the Hard Rock Cafe' before heading home. Mr. Gore & Mr. Muller will be chaperoning this trip, along with Ashley's mom, Christina. If you have any questions or concerns, please contact Mr. Gore. 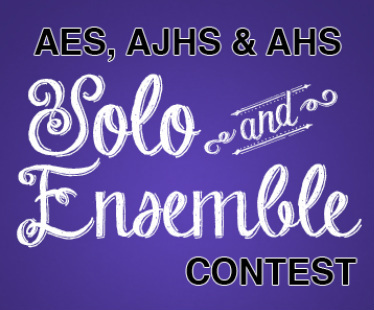 Solo & Ensemble is Saturday, March 12th from 9 am - 2:30 pm in the Arcola band room. Attendance is mandatory and this performance is worth 50 points. Mr. Gore and some high school students will be available after school Monday March 7th and Tuesday March 8th from 3:10pm- 4:30pm to help you practice. If you come in for this time, please arrange for a ride to pick you up by 4:30. You may call and wait for your ride from the band room. Be at the school at least 30 minutes before your performance time. Student warm-up is in the small gym by the cafeteria. Dress nice-no jeans or tennis shoes-you may wear what you wear for band concerts. Be in your assigned room 10 minutes before you perform. Do not enter or leave a room during a performance. You will perform for a judge and small audience. After you perform, the judge will work with you for about 5 minutes. After your performance, you should stay and listen to at least 2 other performers - you do not have to stay for the entire day. Mr. Gore will not be available to help you on Saturday. He has to accompany 30+ students and will be busy all day. Try to ask all of your questions next week before Saturday. Invite your friends and family and neighbors-this event is free to attend. Do not overplay the night before- pace yourself next week. You have had the music since January, do not show up unprepared. 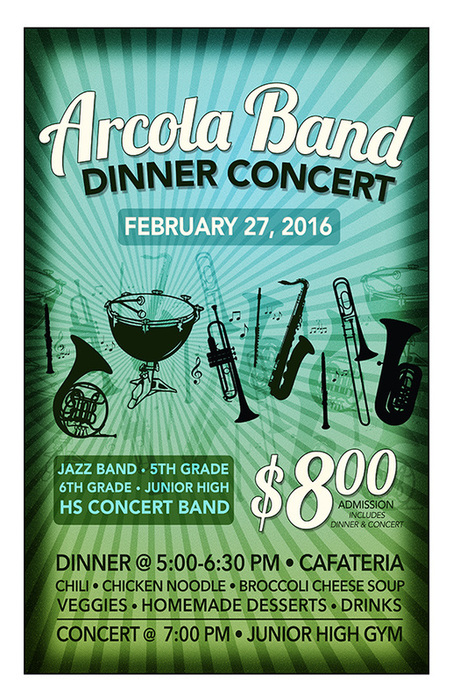 On Saturday, February 27th, the Arcola 5th-12th grade bands will host their annual dinner concert fundraiser. 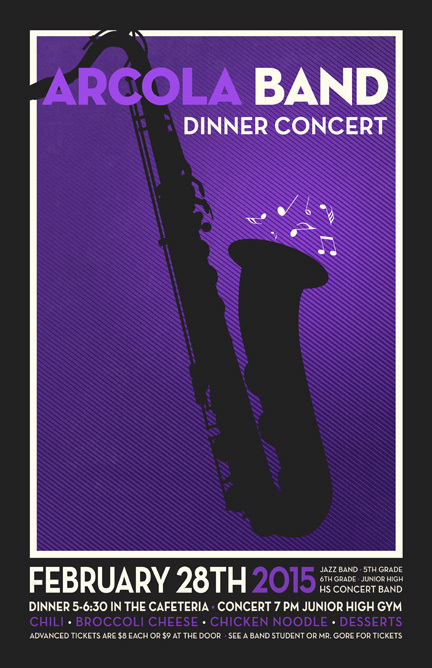 The Dinner Concert is a fundraiser held each year to help raise money for the band department. The dinner will be held prior to the concert in the school cafeteria from 5:00-6:30 pm, and the concert will begin at 7 pm in the junior high gym. We will be serving three different soups (chili, chicken noodle and broccoli cheese), veggies, crackers, drinks and homemade desserts. Musical selections for the junior high band include ‘Dorian Landscapes’ and ‘Rites of Tamburo’. Both pieces explore tonalities outside of the major scale. The junior high will also perform traditional Greek dance music and lullabies in ‘Greek Folk Trilogy’ by Anne McGinty. The high school band will perform the popular Italian march ‘Inglesina’ (Little English Girl) written in 1897, a contrasting modern piece ‘Urban Scenes’ depicting daily life in a big city, and ‘Rumble on the High Plains’ by Michael Sweeney. During the elementary band portion of the concert, 5th and 6th grade band students will introduce the musical concepts covered in class and discuss the historical context of some of the tunes. All band students are required to stay for the entire length of the concert. It is an essential learning experience for our younger band students to hear the older students perform. ADMISSION: We will not be selling tickets this year. Admission will be $8.00 at the door. Children ages 5 and under is free. Band students may eat for $3. Please keep in mind, since this is a fundraiser, admission prices are the same to attend dinner and concert or just the concert. Don’t forget to invite grandparents & neighbors. This is going to be an amazing concert! VOLUNTEERS: Attached is a volunteer sign up sheet. Please return completed form to Mr. Gore by February 22nd. Shifts are only one hour. You will not miss hearing your student play. Jazz band parents are encouraged to not sign up for the last kitchen shift. Parents of senior band students, please take this event off and enjoy the concert. We thank you very much for all your years of hard work and dedication to the Arcola Band Program! DESSERTS: All students in grades 5th-11th are asked to bring a dessert to be served at the dinner. You may send your dessert to school with your student on Friday the 26th or deliver it to the cafeteria on Saturday the 27th between 3:30-4:30 pm. We need all desserts no later than 4:30 pm, please. We request that desserts are not pre-packaged or they can not require refrigeration. Popular desserts are pies, brownies, cakes and cupcakes. Mr. Gore & Arcola Band Boosters Assoc. 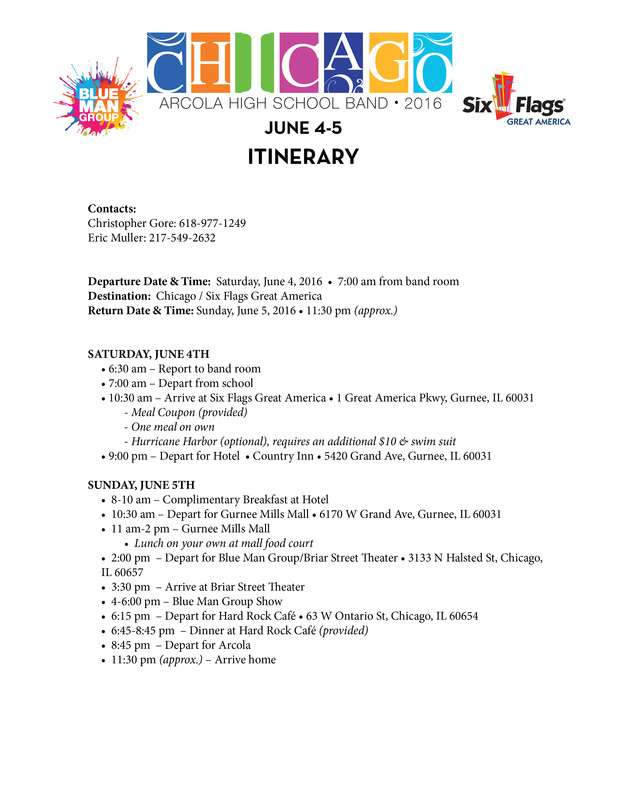 The Arcola High School Band’s summer trip will be to Chicago on Saturday, June 4th - Sunday, June 5th. The band will leave Saturday at 7 am from the band room. They will spend Saturday at Six Flags Great America, and overnight in Gurnee, Illinois at the Country Inn Suites. On Sunday, they will attend a Blue Man Group performance at the Briar Street Theater, and will cap the evening off with dinner at the Hard Rock Cafe. They will arrive back in Arcola around midnight. This is going to be a very fun and educational trip for the students and we hope that many will be able to participate! The Arcola Band Booster Assoc. will be funding all transportation costs for this trip. Bringing the total cost for the trip cost down to $175 per student/participant. This includes, accommodations, amusements park admission, meal coupon for Six Flags, ticket to the Blue Man Group & dinner at dinner at the Hard Rock Cafe. If the students would like to use the water park at Six Flags, they will need to bring an additional $10. They will also need money for one meal on Saturday and lunch on Sunday. You will need to commit to this trip by March 15th. Please fill out the bottom portion of this letter and return to Mr. Gore with your first payment. Many students have balances in their student accounts that can pay their portion of the trip. Those amounts will be posted in the band room. We are also in need of chaperons for this event. If you’re interested in chaperoning, please speak to Mr. Gore. As a courtesy, chaperons are only 2 people to a room, not 4 like the students. If your student has not brought home an information sheet, you may download the flyer along with the payment schedule below. 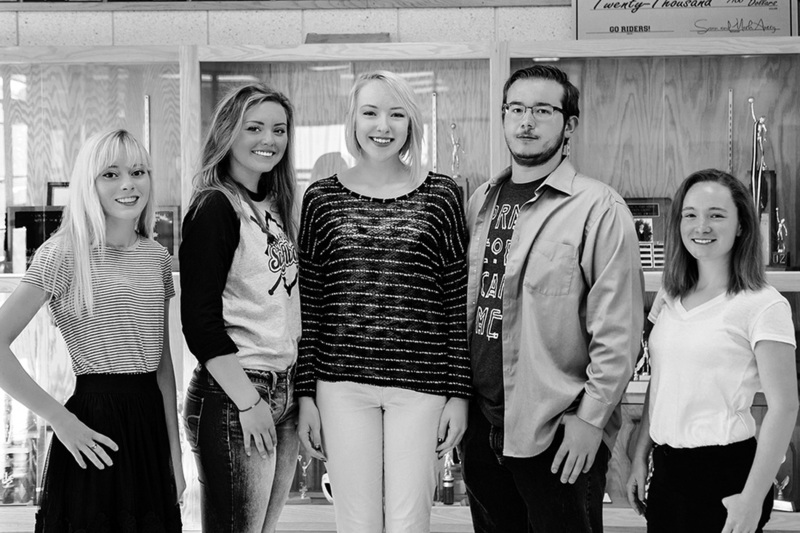 Five students in the music department at Arcola High School have been named Illinois Music Education Association (ILMEA) All-State Musicians. Students will attend a three-day festival January 27th-Janury 30th in Peoria, rehearse under renowned guest conductors and perform in the ILMEA All-State Music Festival on January 30th at the Peoria Civic Center. The students named All-State Musicians are as follows: Ashley Oyler and Lauren Shafer for honors choir, Hannah Warfel (violin) for orchestra, and Dylan Bugos (trumpet) and Eva Corona (flute) for concert band. Members of the All-State Band and Orchestra will audition for honors placement once they arrive in Peoria on January 27th. 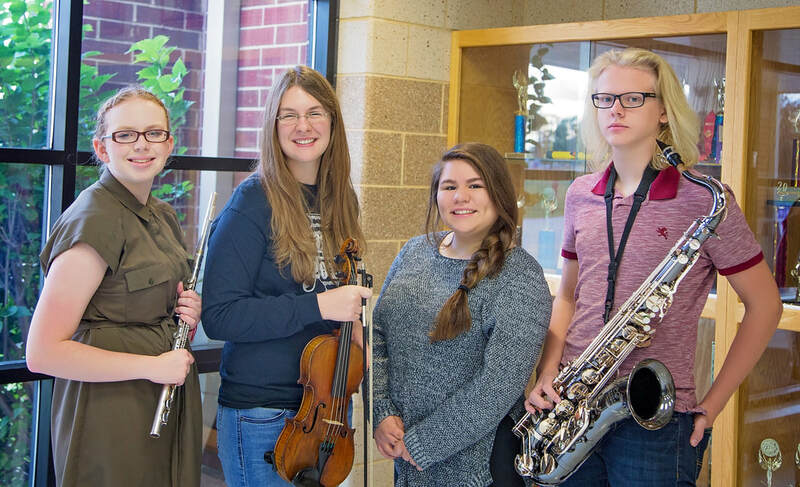 The five students were selected through a rigorous audition in October and participation in the ILMEA District 5 Festival in November at EIU. The ILMEA All-State Festival is a collection of the top 10% musicians from each of the nine ILMEA districts. congratulations ilmea district #5 members! Fourteen Arcola Jr. and Sr. High School musicians have been invited to perform at the upcoming Illinois Music Education Association (ILMEA) District 5 Festivals at Eastern Illinois University. More than 50 area schools from District 5 participated this year in auditions on October 12th at Effingham Jr. and Sr. High Schools. Students from choir and band underwent stringent auditions to qualify for the festivals, to which many began practicing their pieces in private lessons with band and chorus director, Mr. Christopher Gore, over the summer. ILMEA annually selects the most talented musicians in each of the nine Illinois districts to perform at a one-day concert. The District 5 festival will be held November 21st on the campus of Eastern Illinois University. Bands, orchestra and chorus members will attend an all day rehearsal, with multiple concerts held in the evening. Concert times are as follows: 4:30 pm, Junior Band in Dvorak Concert Hall; 5:00 pm, Junior Choir in Union Grand Ballroom; 5:30 pm, Senior Band in Dvorak Concert Hall; 6:00 pm, Senior Choir in Union Grand Ballroom and 6:30 Senior Orchestra in Dvorak Concert Hall. Admission is $5 and open to the public. 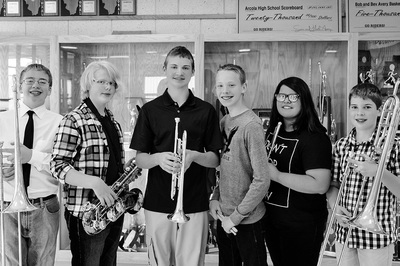 Selected for Junior Band were: Benjamin Rohn and Illusha Budd (7th grade), Myles Bott, Jacob Butler, Mariana Conora & Braedyn Edwards (8th grade). Selected for Senior Choir were: Maggie Fulton (junior), Jennifer Thompson (junior), Colin Beres (senior), Ashley Oyler (senior) and Lauren Shafer (senior). Selected for Senior Band were: Dylan Bugos (senior) and Eva Corona (senior). Hannah Warfel (sophomore) was selected for Senior Orchestra. The district auditions held in October will determine whether 11th and 12th grade musicians receive an invitation to the All-State Festival in Peoria, IL during the 2016 Illinois Music Education Conference on January 27-30, 2016. This is the most prestigious high school music festival in the state of Illinois, and the highest single honor a high school musician can achieve. Last year, Arcola had two choir students (Beres and Shafer) and two band students (Bugos and Corona) invited to perform at the All-State Festival. Congratulations to all of our students for all of your hard work and for receiving this honor! I hope you are having a fantastic summer! Our band camp is August 3rd-7th. All high school band students must attend all dates to learn marching fundamentals and to learn the music and drill to this year’s halftime show. All sections need to meet in July twice before band camp. This time is to go over fundamentals, technique exercises, and to start learning the music for the halftime show. All music must be memorized before August 28th. Please remember that we will spend time outside, so dress appropriately. Do NOT wear flip-flops. Check the schedule on the next page for a daily itinerary. Parents, please also join us Friday, July 31st, at 5:30pm on the football field for a live performance! Students, please wear a purple shirt, black shorts, and tennis shoes for this performance. Because we know you love pizza ... The Arcola Band is holding a Monical's Pizza Community Day Fundraiser on Wednesday, April 8th! It’s easy and tasty! You, your family, friends and neighbors bring the flier below to the Arcola Monical’s Pizza® restaurant location on the day listed below, and enjoy a delicious meal. In return, Monical’s Pizza® will donate 20% of your bill* to the Arcola Band Department. Don’t miss your opportunity to help out! Please remember that this special is ONLY good on APRIL 8TH (open to close) listed below. Tell everyone to join in! We apologize for all of the confusion with the Little Caesar's fundraiser pick up dates. Due to a problem at the distribution center, our pizza will not arrive until next THURSDAY, APRIL 2ND. Pick up will be between 3-5 pm in the AG room. The Ag Room is the garage door just East (right) of the high school entrance. It is imperative that you pick your pizza up during this time. There is no school on Friday, and the pizzas will need to remain frozen. They are in special boxes, and if they do thaw, they can be refrozen. However, they should NOT be left overnight. If you have any questions regarding this please see Mr. Gore or call Kris Bott at 390-2271. Sangamon Valley & LSA has invited us to joing htem for a junior high band festival on March 25th. This festival will follow similar format to the festival at Villa Grove. The concert will start at 7 pm. We will probably around back in Arcola between 9:30-9:45 pm. The band will leave Arcola around 12:30 pm. Our rehearsal will start at 2 pm. They will be serving pizza for dinner. ($5 for 2 slices or $2.50 for 1), please bring this money in a sealed envelope prior to Wednesday morning. Do not forget to get your field trip form signed & turned in prior to Wednesday as well. You will also need to bring your concert dress clothes, a folding stand (if you have one), band folder & pencil. Any questions, please call or visit Mr. Gore. Below is the letter that you have/will be receiving in the mail. Also included are 10 tickets for you or your student to sell. If you did/do not receive this letter please call or email Kris at 390-2271 / bott.kris@gmail.com. Thank you! 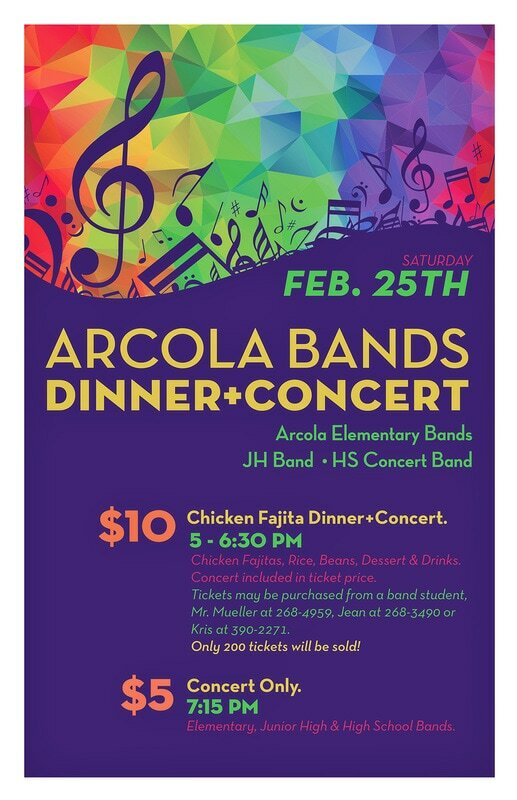 On Saturday, February 28th, the Arcola 5th-12th grade bands will host their annual dinner concert fundraiser. Musical selections for the Junior High Band include: ‘Poet and Peasant Overture’ by Franz von Suppé and ‘Ancient Voices’ by Michael Sweeney. The High School Band will perform works by contemporary composers David Holsinger and Eric Whitacre. During the elementary band portion of the concert, 5th and 6th grade band students will introduce the musical concepts covered and discuss the historical context of each piece. You will also not want to miss the jazz band’s funk rendition of a popular Michael Jackson song. All band students are asked to stay for the entire length of the concert. It is an essential learning experience for our younger band students to hear the older students perform. The Dinner Concert is a fundraiser held each year to help raise money for the band department. This is one of our largest fundraisers of the year and we need everyone’s help for it to be a success! Please keep in mind, since this is a fundraiser, admission prices are the same to attend dinner and concert or just the concert. The dinner will be held prior to the concert in the school cafeteria from 5:00-6:30 pm, and the concert will begin at 7 pm in the junior high gym. We will be serving three different soups (chili, chicken noodle and cheddar broccoli), veggies, crackers, drinks and homemade desserts. TICKETS: Advanced tickets are $8 each or $9 at the door. Admission for children ages 5 and under is free. Band students eat for $3. Enclosed are 10 tickets for you or your student to sell. Money and unsold tickets are due back to Mr. Gore on Monday, February 23rd. Tickets not returned by the 23rd will be voided. Once tickets are voided, they may not be used for admission to the dinner or concert. Please make checks out to ABBA. If you need more tickets, Mr. Gore will have them available in the band room. Don’t forget to ask grandparents & neighbors. This is going to be an amazing concert! VOLUNTEERS: Attached is a volunteer sign up sheet. Please return completed form to Mr. Gore by February 23rd. Shifts are only one hour. You will not miss hearing your student play. Jazz band parents are encouraged to not sign up for the last kitchen shift. Parents of senior band students, please take this event off and enjoy the concert. We thank you very much for all your years of hard work and dedication to the Arcola Band Program! DESSERTS: All students in grades 5th-11th are asked to bring a dessert to be served at the dinner. You may send your dessert to school with your student on Friday the 27th or deliver it to the cafeteria on Saturday the 28th between 3-4:30 pm. We need all desserts no later than 4:30 pm, please. We request that desserts are not pre-packaged or they can not require refrigeration. Popular desserts are pies, brownies, cakes and cupcakes. The Arcola Music Department is proud to announce that four band & chorus juniors were named to All-State and will represent Arcola at the Illinois Music Educator's All-State Music Conference in Peoria next month. 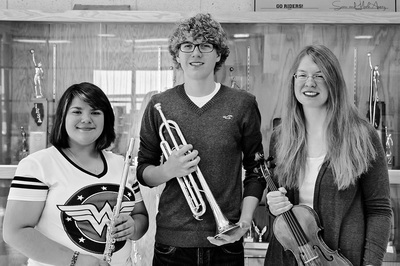 To be selected for All-State ranks them in the top 10% of high school musicians in the state. Honors selection puts them in the top 5%. Colin Beres, Dylan Bugos, Eva Corona, and Lauren Shafer auditioned for District and State Bands & Choir back in October at Effingham High School. 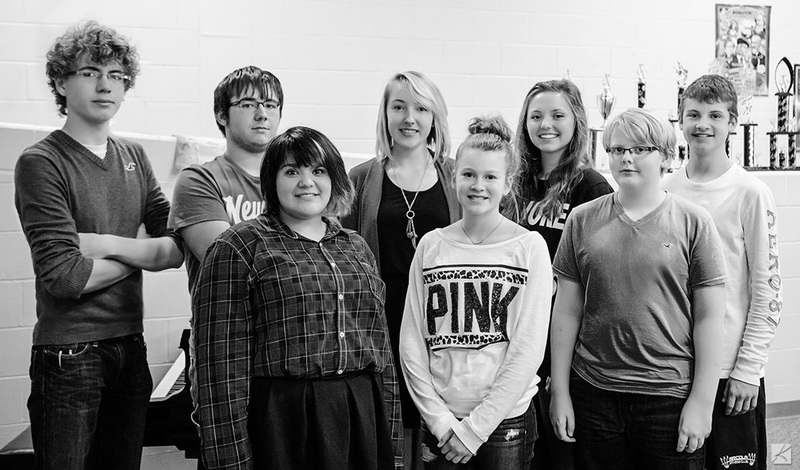 These students were selected & performed at the District Festival at EIU in November. All four students started preparing for their audition back in July in their private studies with Mr. Gore. The group will be in Peoria performing with other top Illinois student musicians January 29th-31st. Dylan, a trumpet player and Eva, a flute player, will re-audition once they arrive at the conference. Colin made the All-State choir as a bass II and Lauren made All-State Honors choir as a Soprano I. CONGRATULATIONS STUDENTS! Just a reminder that FRUIT pick up is tomorrow. If the truck is on time we will be passing out from 2-4:30 pm in the Ag Room. You can pull your car directly up to the Ag garage door, which is located just East of the high school entrance. High school student who are able to help, please report to the Ag room right after school. Thank you!! congratulations iLmea district 5 band and chorus members! 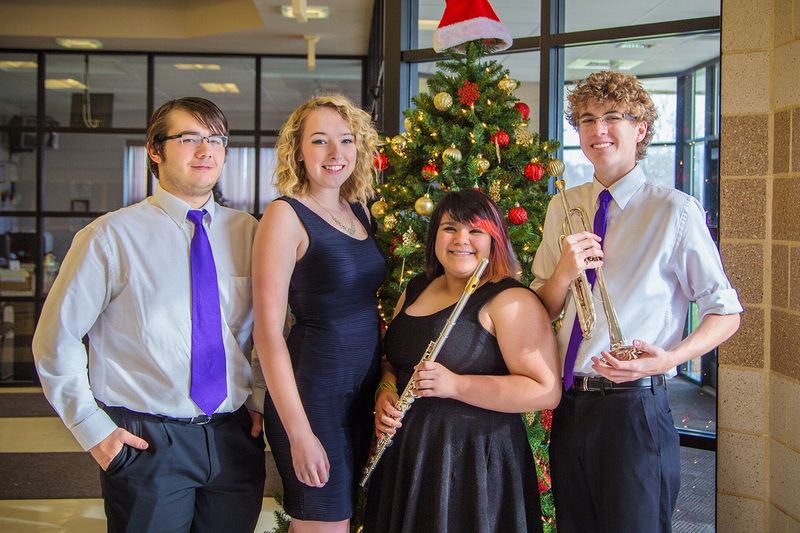 We are proud to announce and congratulate six Arcola high school students, three Arcola junior high students who have been selected to participate in the 2014 Illinois Music Educators Association (ILMEA) Festival. Auditions for the festival took place Oct. 13 at Effingham Jr. & Sr. High School. The festival will consist of band, orchestra and choir. It will be held on November 22nd on the campus of Eastern Illinois University. Concert times are as follows: 4:30 pm, Junior Band in Dvorak Concert Hall; 5:00 pm, Junior Choir in Union Grand Ballroom; 5:30 pm, Senior Band in Dvorak Concert Hall; 6:00 pm, Senior Choir in Union Grand Ballroom and 6:30 Senior Orchestra in Dvorak Concert Hall. Admission is $5. Students selected were: (front l-r) Eva Corona (junior), Molly Mahannah (8th grade), Myles Bott (7th grade) Back row (l-r) Dylan Bugos (junior), Colin Beres (junior), Lauren Shafer (junior), Maggie Fulton (sophomore) and Jacob Butler (7th grade.) Colin, Lauren & Maggie were selected for Senior Choir. Eva and Dylan were selected for Senior Band. Molly was selected for Junior Chorus. Jacob was selected for Junior Band. Myles was selected for Junior Band & Junior Choir. Not pictured is Hannah Warfell (freshman) who was selected for Senior Orchestra. Parade Competition: 1st Place in Class 1A: Drum Majors 1st Place; Color Guard 1st Place; and Drumline 2nd Place. Field Competition: 3rd Place in Class 1A; Drum Majors 2nd place; Color Guard 2nd place; and Drumline 2nd Place. The Oblong Spooktacular is this Saturday, October 25th, and is the marching band's last competition of the season. The schedule for the day is below. Please be at the school at 7:10 am. We will return around 12 am. This day is a long, but fun day! Parents are encouraged to attend, but please arrive early so you don't miss our performance. Students may ride home with parents after the parade performance, but your parents cannot drive your friends. Please have a note signed by a parent in advance if you plan to not ride the bus home. We will be outside most of the day. You will want to wear layers of clothes, bring a coat, hat & gloves. Hand warmers also come in handy. It's suppose to be nice during the day, but it will be cold at night after the parade. You can find directions to Oblong High School by clicking here. The address is: 700 S Range St, Oblong, Illinois. OBLONG TIPS: Oblong is one of band student's favorite competitions. Some long-time Oblong traditions: 1. Drumline Exhibition 2. Shout-outs 3. Fan Favorite Competition 4. Night-Time Parade. Shout-outs are announced as the band is taking the field for competition. You will want to purchase these prior to the band's performance otherwise they might not hear it. They can be purchased for $1 each, and located by the stands under a tent. Fan choice awards are a penny a vote. Last year Arcola took home this award! PARADE: The parade route starts at the park & goes along Main Street. Students usually decorate their instruments & uniforms with glow-sticks. FOOD: Students can of course bring their own lunch & dinner. There are concession stands available at the high school, with a wide variety of meals offered. Once the students are bused over to the park, there are also food vendors set up here. This is typically when students choose to eat dinner. Do not wait to eat until you get back to the high school after the parade. The concession stand will be open, but usually only has drinks & candy. PARENTS: The Oblong Fall Follies is held this weekend. You will have plenty of time between when the kids are bused to the park, and the start of the parade to grab dinner. There are food stands uptown, a couple pizza shops, there is also a gas station on Main Street that has take-out pizza & a Casey's on the East side of Main Street. Robinson is also close enough to go grab a bite. While there are bathrooms inside the school, uptown by the parade route - public restrooms are located in the Community Building which is at the corner of Range & Missouri St. If you have any questions about the day, please feel free to contact Kris or Jean. Each student is responsible for making sure their supplies are put in the trailer and their uniform is put on the bus. GOOD LUCK PRIDE OF THE PURPLE RIDERS! All Band and Chorus students auditioning for ILMEA, on Monday, October 13th need to be at the school by 6:45 am. The bus will leave at 7:00 am sharp. We are hoping to be finished in Effingham around 12 pm. We will be stopping at QQ Buffet in Mattoon for lunch. Please bring lunch money. Any questions, please contact Mr. Gore. Tickets available on the day of the event. Cash or check accepted. Students may only ride home with parents after the competition, but parents can not drive your friends. Please have a note signed by a parent IN ADVANCE (do NOT give it to me as you're leaving) if you do not plan to ride the bus home. Of course we'd like you to stay to support your band during awards. Students need to bring: Uniform, BLACK SOCKS, marching shoes, marching hat, instrument, gloves, valve/slide oil (brass players), extra reeds (woodwinds), extra sticks/mallets (drumline & front ensemble), carriers/harnesses (drumline). Each student is responsible for making sure their supplies are put in the trailer and their uniform is put on the bus. We strongly suggest you bring: Sweatshirt/coat, scarf, hat, gloves, change of clothes, food, money for lunch/dinner, extra socks. Please also note that sometimes the band may go on a couple minutes early, so it's advised to arrive early to the event. If you have any questions, please contact Mr. Gore. Please review the videos from Saturday's performance here. If you have trouble downloading the Google Drive files, try here, here, here and here. Click here to listen to judges tapes from Mt Zion. The marching band will compete in their first marching competition on Saturday, September 27th in Mt. Zion. Students should report to the school at 3:15 pm. The band's performance time is at 7 pm. Awards will be handed out at 10 pm. Typically a small admission is charged for the audience at marching band competitions. You can click here for directions. Students may ride home with parents after the competition, but parents can not drive your friends. Please have a note signed by a parent IN ADVANCE (do NOT give it to me as you're leaving) if you do not plan to ride the bus home. Of course we'd like you to stay to support your band during awards. Concessions will be available for students to eat dinner after they have performed & changed. There are no fast-food restaurants within walking distance of the competition. We do ask if at all possible, you do support Mt. Zion's concessions, as it's their main band fundraiser. Click here to watch and review video from Friday night. James Bond / 007 T-shirts for sale thru August 28th! 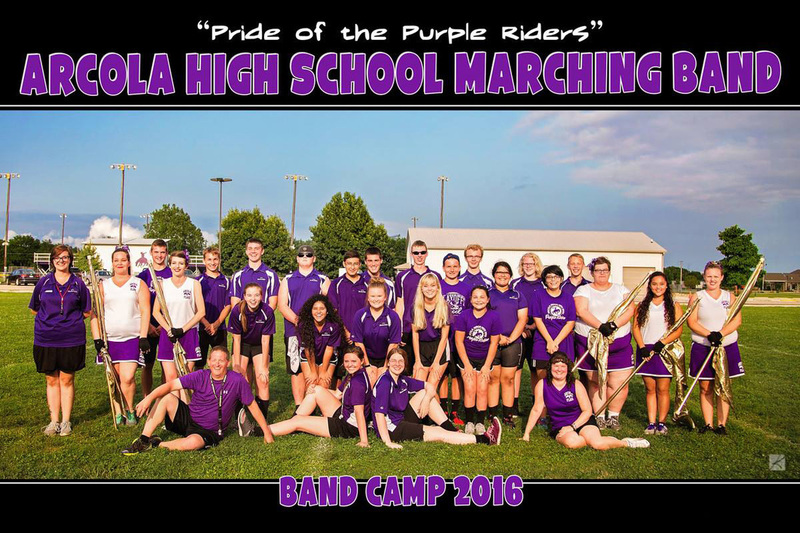 Arcola High School Marching Band performance t-shirts are available for purchase until August 28th. The shirts will feature this year’s marching show, “James Bond / 007.” The t-shirts will be black, with white & bright purple graphics. A list of the band’s performance selections & performance dates will be printed on the back of the shirts. Please fill out the order form below. Shirt orders are due to Mr. Gore (along with payment) no later than THURSDAY, August 28th. Shirts will arrive in time for the first home football game, and will be handed out after school Sept. 4th in the band hall. Any questions please contact Mr. Gore or Kris Bott at 390-2271. During the band potluck last Monday evening, we discussed & handed out information on the band's 2015 Florida trip. Students & chaperones need to commit to this trip by Sept 1st, when the first payment is due. If you did not receive this information, we will be sending it home with your student on Tuesday, August 5th after their uniform fitting. OR you may click the link below to download the information. When payments are turned in, please put them in a sealed envelope with your student's name on the outside. If you have any questions please contact Mr. Gore or Kris Bott at 217-390-2271. Uniform fittings will be held Tuesday, August 5th. Each class please report to the band room at your scheduled time. Only band students will be allowed in the band room during fittings times. If you are a senior, junior or sophomore - when you arrive to the band room get your uniform from last season. If adjustments need to be made we will help you with those. Please do NOT be late. If you have any questions please contact Kris Bott at 217-390-2271.
band camp - july 28th - august 1st!!! Hello students! We hope you've had a fantastic summer! Can you believe that band camp is next week? For those of you that have had lessons over the summer, Mr. Gore gave you an envelope containing this school year's schedule, band camp information & your marching music. For those of you who don't have lessons, envelopes were mailed to your homes last Wednesday (using envelopes you addressed last school year.) If you did not receive it please contact Mr. Gore asap. So here is some information you should know about band camp. All high school band students are required to attend band camp. Here you will learn marching fundamentals and also your music for this year's halftime show & competitions. 3. Tennis shoes - NO FLIP FLOPS! If you wear flip flops, you will change into marching shoes. **For Friday's parent performance, students please wear purple shirt, black shorts and tennis shoes. Please remember we will spend time outside, so dress appropriately. Again, DO NOT wear flip flops. It's also helpful sometimes to bring a hat or sunglasses. Most importantly, be prepared to work hard, but have fun! See you Monday!! We will be holding a band family pot luck to kick off band camp on Monday the 28th at 7pm. The pot luck will be held in the cafeteria. You will also reiceve guidelines for the upcoming school year, along with volunteer sign ups and VERY important information regarding the band's trip to Disney in June 2015. Please try to attend this. Here is what you can bring, the band boosters will provide a cooler of lemonade. FRESHMEN: Drinks, plates & utensils. ﻿﻿Students should dress nice - no jeans or tennis shoes. Students are not required to start until their family is present. Arrive 30 minutes before your performance. Students should warm up in the small gym off of the cafeteria. Be in your assigned room 10 minutes early. Students need to stay and listen to at least 2 more performers. If you have a question ask a chaperone, Mr. Gore will be busy accompanying other students. Also please respect all musicians by turning your cell phones off. Do not enter or exit the room during a performance. Have fun & good luck! There is no admission for this event. Donations collected will help with the purchase of new instruments for the band program. Dear Band Parents - You will be receiving a letter in the mail early this week regarding the upcoming Dinner Concert. The dinner concert will be held on Saturday, February 22nd. The dinner in the cafeteria between 5-6:30 pm. The concert will start at 7 pm in the junior high gym. Tickets are $7 in advance and $8 the night of the concert at the door. Contained within the letter sent home is a letter explaining the format this year, along with a call for volunteers and 10 tickets for each family to sell. Unsold tickets, money for tickets sold and volunteer forms are due back Friday the 14th. We apologize for the short turn around time, if you need until the Tuesday the 18th, just let Mr. Gore know. We are really excited about this concert. Students have been playing exceptionally, and really taking ownership of the program. Please make sure you mark this date on your calendar! To view your letter now, please do so by clicking here. If you have any questions please let us know! Calling all band alumni! 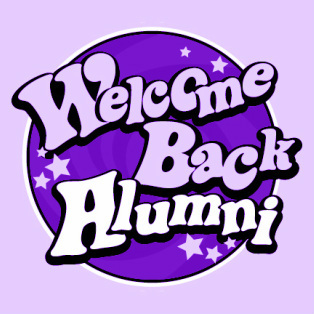 The Arcola band department will host it's annual alumni on Friday, February 21st. We will start playing at 6 pm. Come join the fun, relive the "glory days" and cheer the Purple Riders to victory! The band boosters will have light refreshments in the band room after the game. If you have any questions, please contact Mr. Christopher Gore at the high school. congratulations imea district 5 band and chorus members! 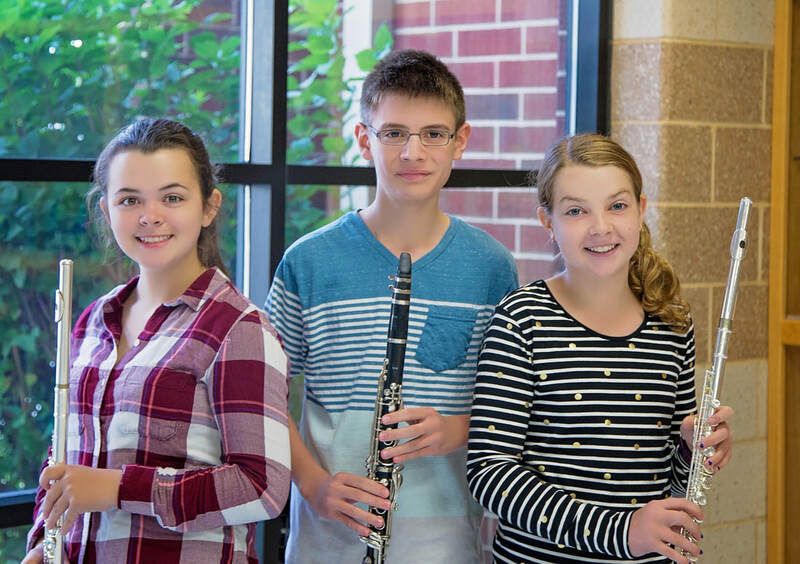 We are proud to announce and congratulate five Arcola high school students, two Arcola junior high students & one 6th grade student who have been selected to participate in the 2013 Illinois Music Educators Association (IMEA) Festival. Auditions for the festival took place Oct. 14 at Effingham Jr. & Sr. High School. The festival will consist of band, orchestra and choir. It will be held on November 23rd on the campus of Eastern Illinois University. Concert times are as follows: 4:00 pm, Junior Band in Dvorak Concert Hall; 4:30 pm, Junior Choir in Union Grand Ballroom; 5:00 pm, Senior Band in Dvorak Concert Hall and 5:30 pm, Senior Choir in Union Grand Ballroom. Admission is $3. Students selected were: (l-r) Madysen Melton (8th grade), Molly Mahannah (7th grade), Lauren Shafer (sophomore) Eva Corona (sophomore), Dylan Bugos (sophomore), Eunice Perez (junior), Collin Beres (sophmore) and Jacob Butler (6th grade.) Eunice, Lauren, & Collin will participate in Senior Choir. Eva and Dylan will participate in Senior Band. 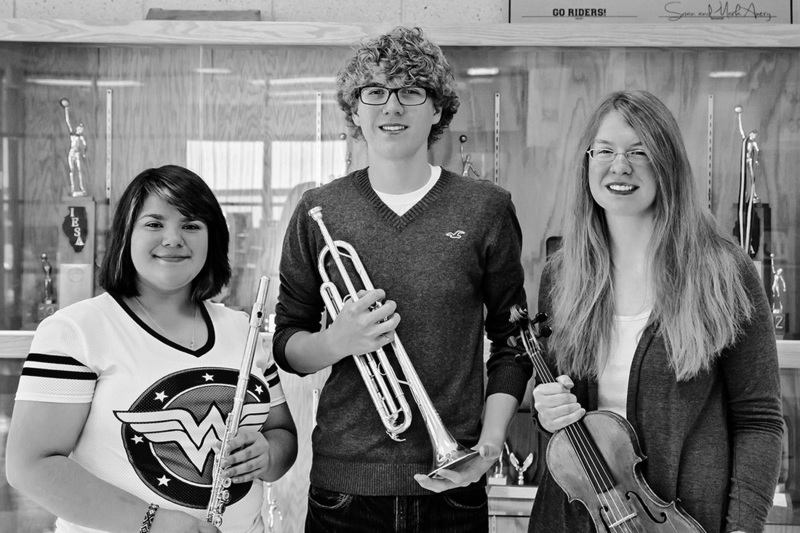 Madysen & Molly will participate in Junior Chorus & Jacob will participate in Junior Band. This year we are using Remind101, a safe text alert app, that allows us to send text and email updates about information class information, reminders, schedule changes. The high school band used it all through marching season, and we love it! It was a great way for to keep them up to date. Thursday, November 7th is the junior high band festival at Tuscola East Prairie. Students will leave the school at 10:30 am on Thursday morning. We will leave for Tuscola around 11 am and stop at the Chinese Buffet for lunch. Please bring about $11 for lunch or bring your own lunch. The bus will leave for hom around 7:45 pm after the concert and be back in Arcola around 8 pm. Your student may leave with you after the concert provide they bring Mr. Gore a signed note in advance. The AHS marching band will perform at 4:30 in the Mt. Zion Marching Music Games on Saturday, September 28th. Report time to band room is 1 pm for practice, the bus will leave at 1:45 sharp. Performance is scheduled for 4:30 pm. Sometimes the bands can go on a little early, so please plan arriving a little early just to be safe. The band will not be staying for awards at this competition. They will head home after playing. Mr. Gore and the drum majors will be heading back over for awards later that evening. If anyone would like to join them please speak to Mr. Gore. Awards are scheduled to be handed out at 10:15 pm. 1. BLACK SOCKS - not ankle socks. Any questions please contact Mr. Gore. The AHS Marching Band will be competing in their first marching competition this Saturday, September 21st in Monticello. Report time to band room is 9 am for practice, the bus will leave at 9:45 sharp. Performance is scheduled for 12:15 pm. Sometimes the bands can go on a little early, so please plan arriving a little early just to be safe. Awards will be handed out at 4:45 pm and the band will depart for home shortly after. Probably arriving back in Arcola around 6 pm. Bring a note IN ADVANCE if you are leaving early with parents. Band camp starts next week! Who's ready? Everyone should have received a couple mailings this summer from Mr. Gore. The first was your music and order forms (marching shoes, band polos, etc.) and the second one was information on band camp. If you did not receive that, please call or email him. • Highlighter for drill charts. Please remember that you will spend time outside, so dress appropriately. Also note on Tuesday and Thursday there will be nighttime rehearsals. Also - PARENTS - please join us Friday, August 2nd at 5:30 pm on the football field for a live performance. Students: please wear a purple shirt, black shorts and tennis shoes for this performance. Any questions, contact Mr. Gore. See you Monday!! To kick off marching season, the band boosters will be having a cook out for the marching band the last day of band camp at 12 pm. We would love to get donations for this cookout to keep our costs low! This is what we need... 7 packs of hot dogs, 9 packs of buns, 4 bags of chips, 1 large container of Country Time Lemonade, and deserts. If you're willing to donate comment below OR email/call Kris Bott. Thanks for your support!! A big hats off to all of the AHS Alumni, band members and flag corps for marching in the 4th of July Freedom Celebration Parade! Also a big thank you to 6th grade band memers Braedyn Edwards & Myles Bott for marching with the band's banner during the parade. Thank you band members for your dedication to the AHS band, and in helping us to raise a little funds! 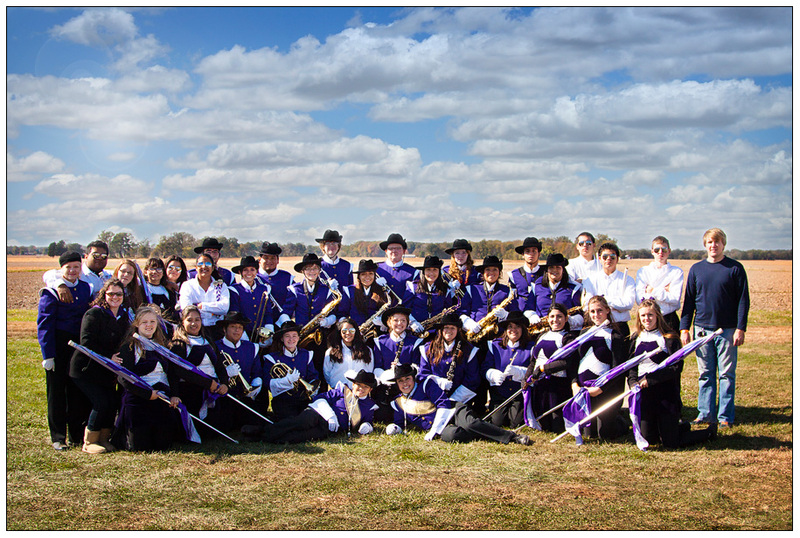 The Arcola High School Band will be marching in the "Freedom Celebration" Parade in Champaign on July 4th. Report time to the band room is 8:30 AM. The bus will leave the school at 9 AM sharp. Attire for the parade is your purple AHS band polo, plain black athletic shorts & tennis shoes. If students would like to ride home with parents, a permission slip is needed before boarding the bus in Arcola. Pick up will be around Lincoln Ave. & Illinois St. (see map). This is close to the Krannert Center. We hope to see many Arcola supporters! Everyone have a very safe & Happy 4th of July! The band and chorus awards night will be held Tuesday, May 7th at 7pm in the band room. High school letters, solo and ensemble medals, and special awards will be handed out at this evening. All band students, grades 5-12, are encouraged to attend. This is a great way to celebrate the end of an excellent school year. Please bring a dessert to share. The band boosters will provide drinks. Also feel free to invite grandparents! The 5-12 band and chorus concert is Thursday, May 2nd, in the Jr high gym. The chorus concert starts at 6pm. The band concert starts at 7pm. Chorus students need to be at the school by 5:45 pm. Students need to go directly to the Jr High Gym. Do not wait in the band room. Band students need to be at the school by 6:45pm. After retrieving your instrument from the band room, go directly to Mrs. Reinhart's room to warm up. Do not make any noise while in the band room. Any sound made in the band room will interrupt the chorus concert. Chorus students:Ladies must wear dress clothes and dress shoes. No jeans or tennis shoes. Gentlemen must wear black shoes, black socks, black pants, white button down shirt, and a purple tie. This Saturday, March 16th, is the Arcola solo & ensemble contest. The event starts at 10 am and goes until about 3:00 pm. 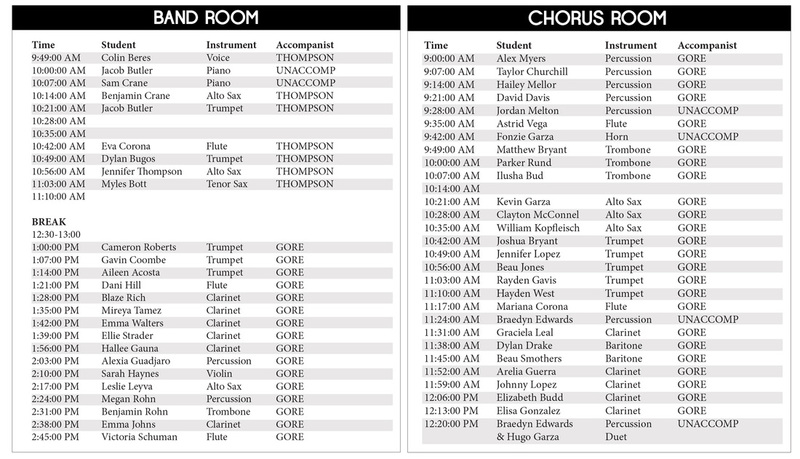 Below you'll find a list of student performance times. Please have your student arrive 30-45 minutes before their schedule performance. Once at the school all students should go directly to the little old gym by the cafeteria for warm-up. Report to your performance room (band room 68 or elementary music room 67) 15 minutes before your schedule performance times. All students should dress nice. NO tennis shoes, jeans or tshirts. After their performance, students should tay and listen to other students perform. Admission is $2 an adult, $1 student, Arcola band students are FREE. We still need a couple more volunteers to take admissions during the event. If you have some time and would like to help out, contact Mr. Gore @ cgore@arcolaschool.com or call Kris Bott at 390-2271. Thanks and good luck students! There will be a brief booster meeting Monday, March 11 @ 6 pm in the band room. We will be finalizing our plans for the Solo & Ensemble contest held in Arcola this upcoming weekend. We are needing volunteers to take admission during the event on Saturday. It will start at 10 am and go until approximately 3 pm. The working shifts available are: 9:30-10:30, 10:30-11:30, 11:30-12:30, 12:30-1:30, 1:30-2:30, 2:30-3:00. We are looking for 2 volunteers for each shift. If you're able to help, please contact Mr. Gore or Kris Bott @krisbott@gmx.com. Thanks! 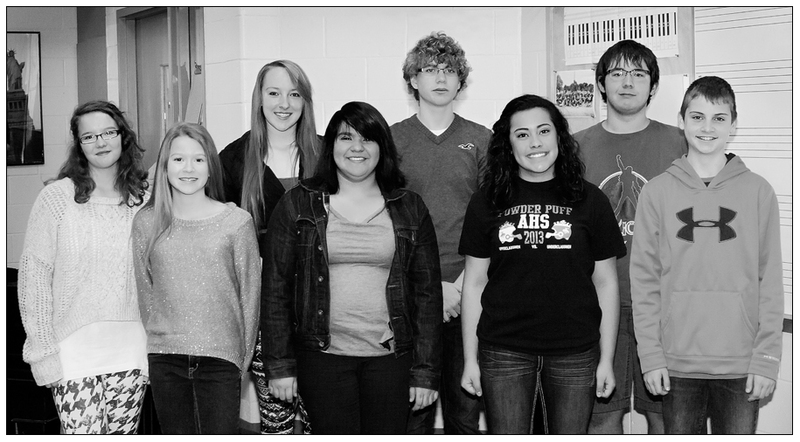 Solo & Ensemble contest for grades 5-12, will be held Saturday, March 16th in the Arcola School music department. Schedules will be posted soon. We will have an informational and planning meeting on Monday, March 11th. We will meet in the band room at 6 pm. The meeting will not last more than an hour. More information coming soon! Due to the Boys' basketball tournament being pushed back a day due to weather, the Musical Dinner Concert has been relocated to the junior high gym. Junior High & High School students should report to the gym at 9 am, to help set up the gym. Parents, don't forget to send a dessert. Band students who are performing, their dinner is $3.00. They need to be at the school, in concert attire, at 5 pm. If you have any questions, please contact Mr. Gore or Kris Bott at 390-2271. The Musical Dinner Concert is right around the corner. The students are so excited about this year's concert. Let's show our support by making this the most successful dinner concert yet! Students and parents will be calling around this week filling up volunteer slots. Students grades 7-12 are asked to report to the gym at 9 am on Saturday morning to help set up tables and chairs, bring a parent and it will go faster! We should finish around 10 am. We also need one person from every family to work a serving shift, plus bring a dessert to share. (No refrigerated items please!) If you would first pick of the shifts available, please contact Kris Bott at krisbott@gmx.com or at 390-2271. Thank you for supporting the high school & junior high bands! A newsletter was sent home last week with students for band parents. If you have not received yours please click below to download it. Guitar ensemble has started! Every Monday afternoon from 4:30-5:20 high school students learn guitar technique and how to read guitar notation and chords. We just had our 3rd session, so it is not too late to join. Any high school band or chorus student is welcome. Free to join, just bring a guitar! There will be a band parent meeting on Monday, FEBRUARY 4TH at 6 pm in the band room. This is a very important meeting, where will discuss and plan the Musical Dinner Concert. All parents of junior high and high school band members are encouraged to attend. The 5-12 band and choral concert is Sunday, December 9th in the Junior High gym at Arcola High School. Band concert is at 2 pm and chorus concert is at 3:30 pm. Band students need to be at the school by 1:40 (Jazz Band 1:30), chorus students need to be at the school by 3:00. Once you have your instrument and music, go and sit on the southwest bleachers and wait to warm-up. Gentlemen must wear black socks, black shoes, black pants, white button down shirt and purple tie. Purple tie from band boosters are $3. Ladies must wear black shoes, a black or white dress, or black pants and a black or white top. The concerts will be held Saturday, November 17th on the campus of EIU in Charleston. We will leave the band room at 7 am. Please bring money for lunch and your concert attire. Congratulations IMEA District #5 band & Chorus members! 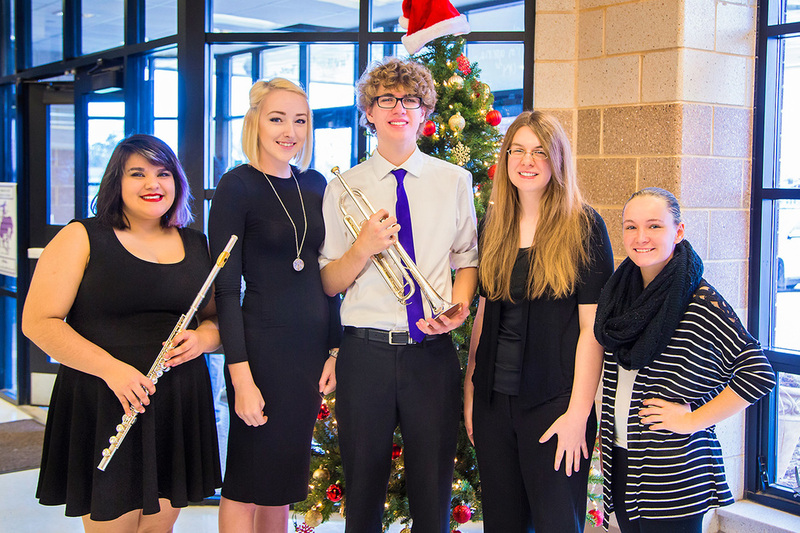 We are proud to announce and congratulate six Arcola high school students and three Arcola junior high students who have been selected to participate in the 2012 Illinois Music Educators Association (IMEA) Festival. Auditions for the festival took place Oct. 8 at Effingham Jr. & Sr. High School. The festival will consist of band, orchestra and choir. It will be held on November 17th on the campus of Eastern Illinois University. Concert times are as follows: 4:00 pm, Junior Band in Dvorak Concert Hall; 4:30 pm, Junior Choir in Union Grand Ballroom; 5:00 pm, Senior Band in Dvorak Concert Hall and 5:30 pm, Senior Choir in Union Grand Ballroom. Admission is $3. High School students elected were: (l-r) Daneli Rabanalez-Hernandez (senior), Eva Corona (freshman), Dylan Bugos (freshman), Lauren Shafer (freshman), Kennedy Byard (senior) and Eunice Perez (sophomore). Daneli, Kennedy, Eunice and Lauren auditioned and were selected for Senior Choir. Daneli Rabenalez-Hernandez was also selected for All-State Choir, that will be held in January in Peoria. Eva and Dylan auditioned and were selected for Senior Band. Junior High students selected where (l-r) Jennifer Thompson, Maggie Fulton and Madysen Melton. Jennifer was selected for Junior Band, and Maggie and Madysen were selected for Junior Choir. Congratulations students! Hello 2012/2013 school year! The school year is off to a great start, and we’re really excited to have a website up and running. Here you will find updates for everything MUSIC at Arcola schools, for grades 5-12. We will post about band & chorus news, fundraising information, booster information, events, and happenings. Be sure to check back often. If you use electronic calendars, please move over to the calendar page and sync the band & chorus calendar with your mobile device and/or computer. As always if you have any questions please contact Mr. Christopher Gore at cgore@arcolaschools.com or 268-4962.